Five years after the Deepwater Horizon oil spill, Southeast Louisiana is situated to capture the economic opportunity of a lifetime—an opportunity that’s derived from a water management economy catalyzed by massive federal investment and augmented by state and local investments in coastal restoration, levees, and urban water innovations. Water management has the potential to be to Southeast Louisiana what software is to Austin, what biotech is to Boston, or what e-commerce is to Seattle. [i] A water management cluster—one that contains local companies large and small that compete, innovate, collaborate, and ultimately export knowledge to other regions all the while investing and growing jobs within Southeast Louisiana—is within reach. However, in order to become a nationally-recognized cluster built upon regional expertise, certain economic, social, and political factors must be aligned to propel the water management economy from a mere concentration of jobs into a vibrant economic cluster. To date, the federal government has committed billions of dollars to protect New Orleans from future flooding and coastal land loss, and billions more are anticipated via BP and Transocean Clean Water Act criminal and civil penalties. Infusions of federal funds have catalyzed clusters before, most recognizably Silicon Valley, which was set in motion by military investment in radio technology. [ii] In fact, the largest employer in the Valley for decades was Lockheed Martin, a firm highly dependent on federal contracts. [iii] On the other hand, federal dollars have failed to turn southern Virginia, with its heavy military presence, into a self-sustaining cluster. [iv] The factors explaining these divergent paths were the presence or absence of supporting economic, social, and political forces. Academic, private, nonprofit, federal, and social facilitation for computer technology all had a role in turning Silicon Valley into the economic powerhouse it is today. Conversely, the absence of this support can stymie a sector’s ability to compete nationally. Southeast Louisiana’s water management demand drivers—representing billions of dollars in investment—include public and private stakeholders. Water management is work done to manipulate the water-related physical environment. In Louisiana, this economy includes all work designing and constructing coastal restoration, coastal protection, and urban water management projects. A major player in water management is the Louisiana Coastal Protection and Restoration Authority (CPRA). 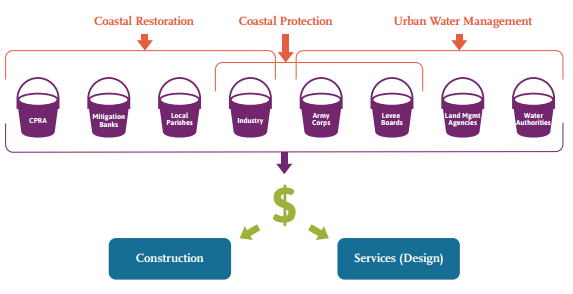 The CPRA plans coastal restoration and protection projects that align with state coastal master plans updated every five years. Through its coastal program, the CPRA allocates to partner agencies (such as the U.S. Army Corps of Engineers and local levee boards) money and authority to lead many projects, while also awarding contracts for many projects directly itself. More than $6 billion were spent from 2007 to 2014 by CPRA and partner agencies on master plan projects, and much of the design and construction for these projects was contracted out to private companies. From 2010 to 2014, the CPRA awarded an annual average of $53 million in regular services contracts and from 2007 to 2013, an annual average of $94 million in construction contracts. The Army Corps, in master plan-related and unrelated activities, awarded an annual average of $453 million in construction contracts and $24 million in services contracts between 2010 and 2014. Services source: The Data Center analysis of data gathered from CPRA IDIQ services contracts and LaTrac. Construction source: The Data Center analysis of data gathered from CPRA completion reports, cash transfer data gathered by GNO Inc., and internal CPRA project data. Source: The Data Center analysis of data from USASPENDING.gov, a federal contracts database mandated by the Federal Funding and Accounting Transparency Act (FFATA) of 2006 and managed by the Office of Management and Budget (OMB). Source: The Data Center analysis of data from RIBITS, an Army Corps database. The water management cluster is currently a hybrid of hub-and-spoke and satellite platform style districts with a mix of large local companies and branches of large companies from outside. Because water management services and construction contracts tend to be upwards of a million dollars, prime contractors are often larger companies. And because of the interdisciplinary nature of water management work, these primes subcontract a substantial percentage of their work to mostly small, mostly local firms. Both multi-national companies, such as Arcadis, and established local firms, such as Royal Engineering win prime contracts from agencies, and they then subcontract out to an array of firms, many local. A hub-and-spoke district features large locally-headquartered firms closely connected to related producers and suppliers, such as Silicon Valley, where Google, Intel, and Apple (among others) are the hubs of the computer universe, supporting a host of spin-offs and supportive companies. A satellite platform district consists of branch plant operations of major companies headqurtered elsewhere, such as the Research Triangle, were R&D arms of many international companies have clustered in North Carolina. From 2010 to 2014, Louisiana firms secured more than 80 percent of both construction and services prime contracts from the Army Corps. Louisiana firms that secured Army Corps construction contracts were more likely to be large (1,000 or more employees) while Louisiana firms that secured services contracts were more likely to be small (less than 100 employees). During the same time frame, nearly half of all CPRA construction and regular services contracts were also secured by Louisiana firms. More detailed data gathered on these CPRA services contracts revealed that Louisiana firms were less likely to receive contracts for engineering, environmental sciences consulting, and geotechnical services, but more likely to win contracts for surveying and professional land services. Building the capacity and opportunities for the more technical engineering and scientific services firms in Louisiana could improve the innovative ability of the cluster locally. Louisiana water management firms compete well locally and are starting to compete outside the state, resulting in thousands of new jobs since 2010. 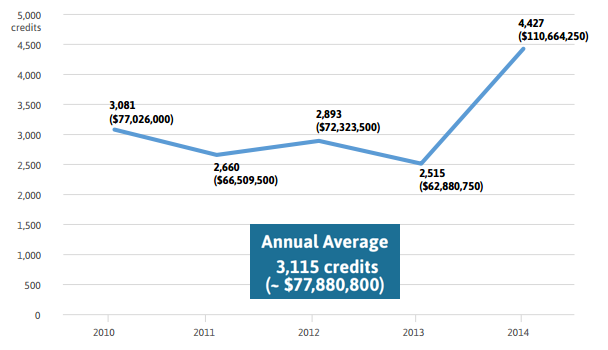 Louisiana firms captured an average of nearly $13 million per year in Army Corps contracts outside Louisiana from 2010 to 2014. In addition, between 2012 and 2014, they won at least $225 million in federal and regional Hurricane Sandy contracts. Large local construction firms, including Cajun Constructors, Weeks Marine, and Mike Hooks, have been at the forefront of seeking out markets outside Louisiana. It is no surprise then that Southeast Louisiana has seen steady job growth in water management, with over 14,000 jobs added since 2010, exceeding that of many other metros competing in this field. 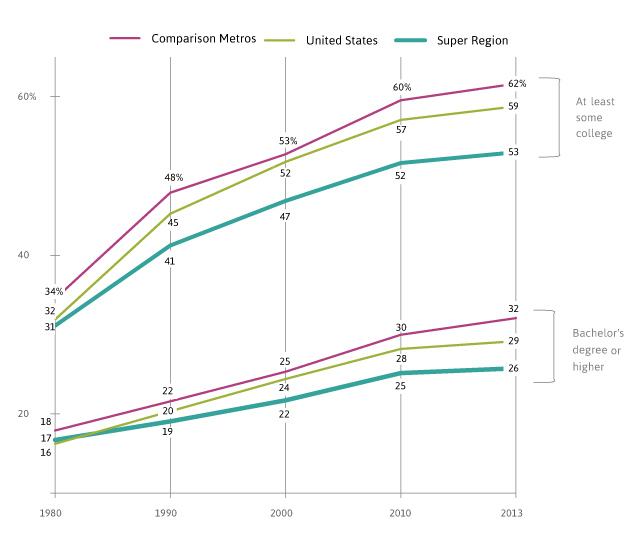 Source: The Data Center analysis of data from EMSI and Cluster Mapping. Louisiana firms have room for growth in tapping markets outside the state with billions of dollars available in water management contracts nationwide. Louisiana firms win more total Army Corps contract dollars than firms in any other state because of the tremendous number of projects within Louisiana. However, a few other states win a higher share of out-of-state dollars, including Illinois, whose firms win nearly five times as many out-of-state Army Corps contract dollars as Louisiana firms. The market potential for Louisiana firms is substantial, given that Army Corps contracts alone reached nearly $1 billion annually outside of Louisiana from 2010 to 2014. Other state and federal actors, from water management districts in Florida to the National Resource Conservation Service (NRCS) to the government of Bangladesh to storm water agencies in Denver are heavily involved in water management as well. [ix] The opportunity exists for Louisiana companies to build their expertise through local contracts while also increasingly looking for contracts outside the state. Workforce development initiatives that produce more skilled labor must be scaled up to support the development of Southeast Louisiana’s water management cluster. Southeast Louisiana lags behind the United States and comparison metros in educational attainment, with only 26 percent of adults 25 and older holding a bachelor’s degree or higher, and only 53 percent with at least some college by 2013. In contrast, metros competing in this sector had 32 percent of adults with a bachelor’s degree or higher and 62 percent with at least some college. Since the Great Recession, Louisiana has cut higher education funding by 42 percent. Louisiana’s cuts were the 4th highest of all states during this crucial time frame. [x] Many experts assert that investments in human capital are far more important than any other investment for driving economic growth in today’s economy. [xi] Louisiana’s ranking as 45th in graduating science and engineering majors in 2011 needs to improve to feed water management, an industry hungry for STEM workers. Source: U.S. Census Bureau, Decennial Census & 2013 American Community Survey. Public and private programs are needed to buoy the investment and research & development ecosystems in Southeast Louisiana. Private investment, especially venture capital, is a leading indicator of cluster growth, but in the Super Region, such capital has been limited. Out of the four stages of investment,—seed, angel, venture, post-venture—the Super Region ranked 7th out of 10 metros in seed investment and ranked lower in each other stage. 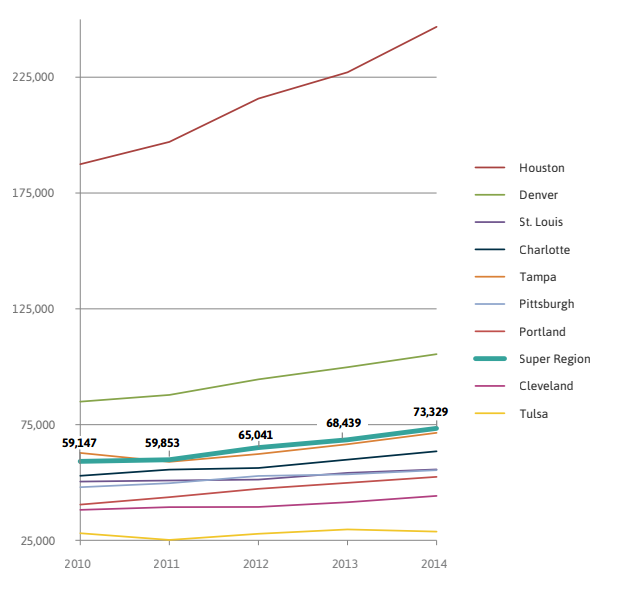 From 2010 to 2014, while metros such as Portland, Denver, and Pittsburgh saw millions of dollars in private investment, the Super Region paled in comparison. Couple that with weak funding for research and development—Louisiana ranks below the nation and in the bottom 15 states in academic science & engineering, business-performed, federally-obligated, and state-sponsored research and development funding—and the region will struggle to stimulate the innovation needed to develop a cluster that will last. Source: The Data Center analysis of data from Mattermark. Notes: Location refers to the location of the company receiving investment, not the location of the investor. Notes: Venture funding is comprised of venture and series A-G funding. Greater philanthropic support for environmental organizations as well as recruiting board members with influence in economic development, education, and employment organizations can help to increase civic clout and foster idea exchange in support of the water management cluster. 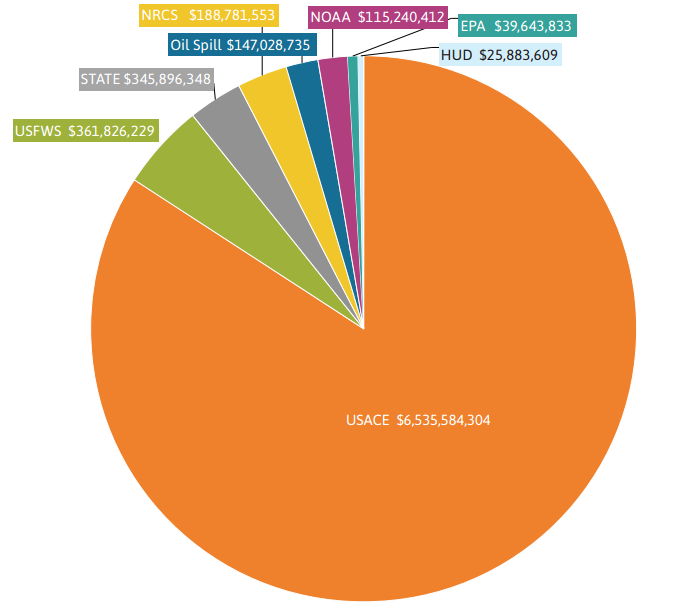 Just 5 percent of regional foundation grant-giving went to environmental causes in 2012, compared to over 7 percent from national foundations. Meanwhile, environmental organizations in the Super Region shared under 1 percent board overlap with many key sectors in 2013—indicating that additional work can be done in the social sphere to build momentum behind the water management cluster. Source: The Data Center analysis of data from the Foundation Center. 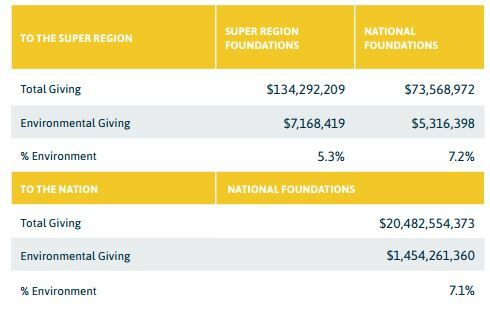 Notes: National foundations are foundations located outside Louisiana. Source: The Data Center analysis of data from the Foundation Center, the 2013 American Community Survey, and NOAA. Notes: Highly vulnerable coastline includes coastline that NOAA has designated as having “high” and “very high” vulnerablility. Coastline that has “moderate” vulnerablility is not included. Notes: Coastline is measured in miles. While there is significant political support for water management in Louisiana, a deficit in sustainable sources of state funding for coastal restoration and protection and a subsidy/exemption system that favors other industries are concerning. Source: Coastal Protection and Restoration Authority, “Fiscal Year 2016 Annual Plan, FY 2016 Implementation Plan”. Notes: Planned refers to projects funded for design or construction between 2016 and 2018 according to the CPRA Draft FY 2016 Implementation Plan. On other measures, state support for water management is dwarfed by support for other industries. 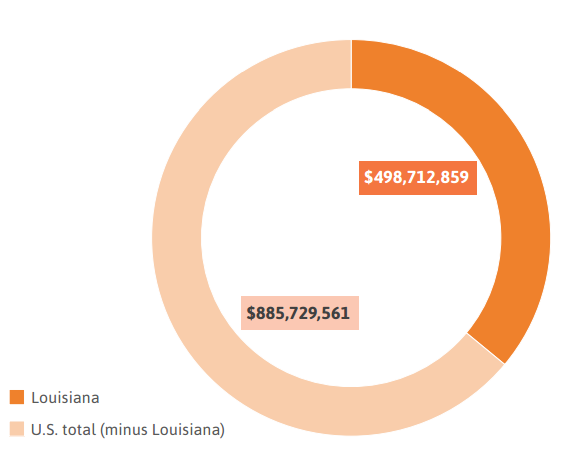 Louisiana subsidies/exemptions data from 2010 to 2013 indicate a number of industries receiving hundreds of millions of dollars per year in subsidies/exemptions. In contrast, water management companies received on average $6 million per year in subsidies/exemptions. The research is clear: it takes time and sustained effort to create a cluster. A water management cluster will not emerge overnight but the fundamentals for one in Southeast Louisiana are there. 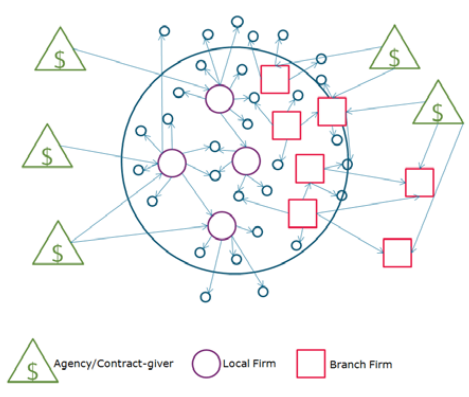 To be sure, building a network of water management firms, institutions of knowledge creation, industry-specific managerial and technical talent, and ancillary legal and financial services will be an essential step in developing the ecosystem needed to grow the cluster. This network will also be useful for developing the political will needed to sustain the effort. Moreover, leaders will need to continuously learn and adapt. This will require trust, which is best fostered through transparency, accountability, and the use of data to inform decisionmaking. Southeast Louisiana has the opportunity to add water management to gumbo, jazz, and Katrina, as one of the iconic images of our region in the national psyche. The opportunity is manifested in an influx of federal dollars, a state agency dedicated solely to the restoration of the coast, and a fierce momentum behind remaking our urban landscape so that we may live with and not despite water. The Coastal Index 2015 aims to provide leaders with concrete data on the potential of this cluster as well as weaknesses that will need shoring up if water management is to become a permanent driver of prosperity for Southeast Louisiana. With long term strategies to increase workforce skills, build civic momentum, and accelerate private investment, water management can evolve from a mere concentration of jobs into a self-sustaining cluster. [i] Owen-Smith, J., & Powell, W. W. (2004). Knowledge networks as channels and conduits: The effects of spillovers in the Boston biotechnology community. Organization Science, 15(1), 5-21. [ii] Kenney, Martin, ed. (2000) Understanding Silicon Valley: the anatomy of an entrepreneurial region. Palo Alto, CA: Stanford University Press. [iii] Leslie, S. W. (2000). The biggest “angel” of them all: The military and the making of Silicon Valley. In M. Kenney (Ed. 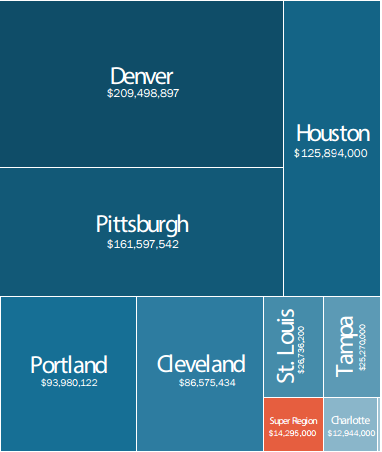 ), Understanding Silicon Valley: The anatomy of an entrepreneurial region (pp. 48-70). Palo Alto, CA: Stanford University Press. [iv] Hampton Roads Planning District Commission. (2013, October). Economic impact of the Department of Defense in Hampton Roads. [ix] Each of these agencies was listed in the relevant projects sections of successful CPRA regular services contracts. Examples of some of these agencies’ water management work can be found here: http://www.nrcs.usda.gov/wps/portal/nrcs/main/national/water/manage/, http://www.dep.state.fl.us/secretary/watman/. [xi] Glaeser, E. L. & Saiz, A. (2004). The Rise of the Skilled City. Brookings-Wharton Papers on Urban Affairs, 5, 47-94.